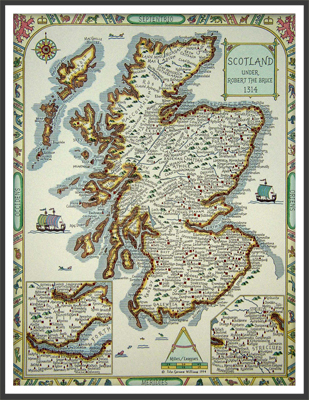 Highland Line International is a family business dedicated to the preservation of Scottish culture and heritage. The reason I chose Highland Line as a name is twofold. Not only does it conjure up images of our heroic ancestors racing across battlefields shouting their war cries and flying the flags of their clan chiefs, but it represents the line of which all Scots, near and far, have come from. I wanted to create a quality product, a fitting legacy to a proud and ancient culture. Our products are made to exacting standards and come in a variety of styles and sizes. Each Highland Line flag incorporates either the ancient or modern tartan of the clan and it's respective crest. We hope you enjoy your flag as you fly it proudly in a place of prominence inside or outside your home. Please also send us a photo of your new flag for our online photo gallery so that others may see how proud you are of your Scottish heritage.